An infant bodysuit is a garment designed to be worn by infants much like a T-shirt; they are distinguished from T-shirts by an extension below the waist, with snaps or Velcro that allow it to be closed over the crotch. The purpose of the opening at the crotch is to facilitate access to the infant's diaper. 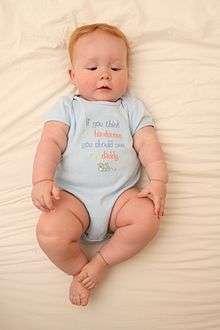 Like T-shirts, infant bodysuits come in a wide variety of designs and may be worn as undergarments or as outer shirts. Other names of this outfit include Onesies (a registered trademark often used in the United States as if it were generic), creepers, diaper shirts, babygro, babygrow, mameluco or snapsuits. Babygro is also a trademark brand, invented in the U.S. in the 1950s by Walter Artzt. ↑ "Onesie - Google Search". Retrieved 2009-04-14. ↑ "WIPO Domain Name Decision: D2008-1172". ↑ "BABYGRO". The Probert Encyclopaedia of Costume. Archived from the original on 19 August 2010. Retrieved 2007-04-08.